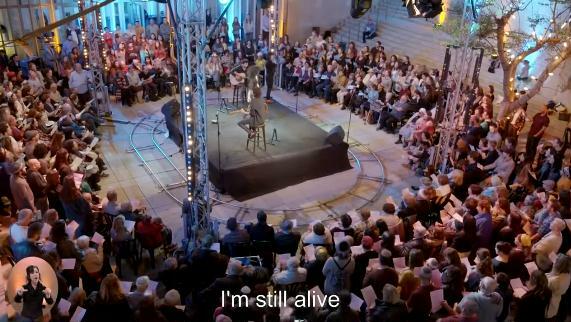 As Israel commemorates Holocaust Remembrance Day, 600 Holocaust survivors and their families met in Jerusalem and celebrated their life through song. Leading up to Yom Hashoah (Holocaust Martyrs' and Heroes' Remembrance Day), six hundred Holocaust survivors and their families, including second, third, and even fourth generation survivors, gathered at Jerusalem’s Beit Avi Chai to unite in recording, in Hebrew, Ofra Haza’s Chai (Hebrew for “alive”). The song Chai was specifically chosen for this event. It was written by the late Ehud Manor and composed by Avi Toledano for the 1983 Eurovision Competition in Munich. As the song was being recorded, many of the survivors were overcome with emotion. Hands shaking, some with concentration camp numbers visible on their arms, yet hands planted firmly on their Israeli children and grandchildren, they described their memories of the horrors – and survival. Many family members arrived from all over the country, some from abroad, to join their grandparents and great-grandparents in this unique event.